The first thing that Red Delicious Apple remembered was being a flower and the way the birds sounded in the trees. Later, Apple remembered the wind and losing his petals. Apple wanted to jump down after them, but stayed on the branch, in the tree. 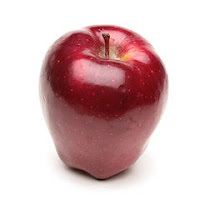 Apple grew up, got wider, filled out, and began changing colors. He hung on by the stem even as the others began falling to the ground. He was afraid until the hand reached up, pulled him off the branch, and piled him in a bushel basket. Apple said goodbye to tree and brought his stem with him, a few small leaves, but he didn’t know where they were taking him. He bumped against the others and was afraid. The next thing that Apple remembered was the bright lights, another hand, and a plastic bag. He thought that maybe he was being suffocated, but he still trusted the hand, which eventually placed him in a small basket with others he didn’t recognize. There was a green and fat-bottomed couple, a small gang of long and spotted yellows. It wasn’t long after that, though, that the hand delivered Apple to the teeth. Apple could feel the teeth cutting through his skin and into his meat, what was left of his insides turning brown, sickening, softening. The last thing Apple remembered was the trashcan, the lid, the rotting darkness. I am a fan of rotting darkness. me too! rotting darkness is brilliant. Thank you, G, G, and G. And Susan, yes, I too have great sympathy for Red Delicious Apple. You made this whole thing up, right? Niiiiiiiiiiiiice. Yes, completely made up. So true. When will fruits and vegetables learn? Never trust The Hand! How Much Can I Write on a Postcard?